Gov. 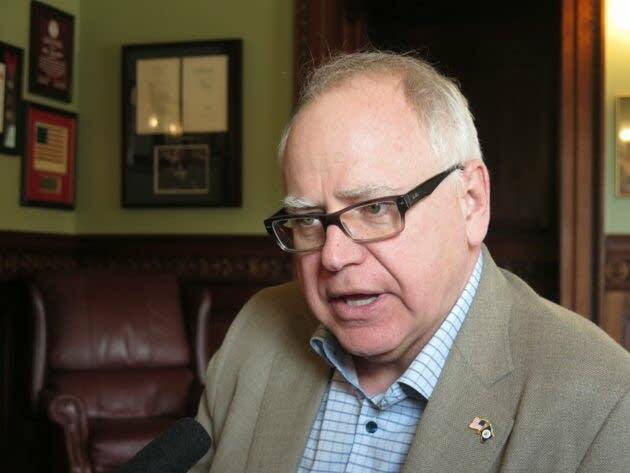 Tim Walz wants drug companies to do more to combat opioid abuse in Minnesota — a desire he says he shared during a 45-minute conference call on Tuesday with opioid manufacturers and distributors. The DFL governor says he's reminded almost daily of the scope of the problem and expects to sign a piece of meaningful legislation this year to address Minnesota's opioid crisis. "It's one that's touched all of our families," he told reporters after the conference call. "These are our children dying. These are our neighbors dying. It is taking an incredible human toll as well as an economic toll on our state." Walz didn't identify the drug company representatives on the call. He said they were not CEOs. Walz stressed that he is not out to demonize the drug industry. He said he wanted a candid discussion with company representatives as well as their help. "It was very clear by the folks on the phone, they share that ethical compassion that we need to reduce the number of people impacted by opioid addiction," he said. "We have to do a better job of managing how these things get in the hands of the wrong people, and we need to take responsibility as a state and an industry to make that happen." Walz said he made clear that he wants a funding source to pay for the fight against opioid abuse. Drug companies have resisted proposals that put them on the hook for the costs. But Walz noted more than once that the industry enjoys big profits. He also acknowledged that those companies will likely pass the cost of a fix on to their customers. "The pieces of legislation that move are not going to fix the long-range problem all the way by themselves. But it gives us the first real tangible move in that direction, and we can build on it," he said. State lawmakers are considering legislation this session that would impose increased licensing fees on manufacturers and wholesalers totaling $20 million a year. The revenue would fund prevention and treatment efforts throughout the state. One of the sponsors of the proposal, Sen. Julie Rosen, R-Vernon Center, said she urged Walz in a recent private meeting to turn up the heat on drug companies. She said she wants to "make sure that everybody, whether it's the House, the Senate or the governor's office, has everybody at the table to deal with this." Legislation backed by Rosen and others would also establish an opiate stewardship advisory council, which would develop a statewide strategy to fight addiction. Walz puts out his budget recommendations on Feb. 19.